Politecnico di Milano, in order to present the School of Design in its own stand at Salone del Mobile 2013, asked DensityDesign to realize a 4 mt x 2 mt poster showing the structure and the efficiency of the School of Design system at Politecnico. The visualization is a picture of the 2010 / 2011 academic year. We began with the visualization of the figures related to students. We decided to integrate the visualization with informations realted to credits distribution. 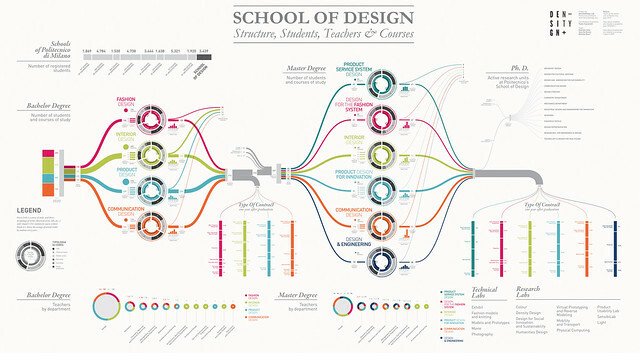 Every circle is a course of study and shows its typology of exams (theorical curses, labs, etc…) with related C.F.U. (university course credits). Inside it is shown the average of earned credits by students every year. In the right side you can see the same data related to master degree. The poster has been completed with informations about Ph.Ds, technical and research labs and the number of students for each school of Politecnico. The poster was realized in one week by Gabriele Calvi and Sara De Donno with the supervision of Michele Mauri. This is a beautiful example of information visualisation – thanks.